I can’t believe that its already been a week since I left the U.S. It has been really fun being back in Tamale and visiting the CWS water treatment centers. Unfortunately, I was totally fooled by the weather in Accra, it is NOT cool and breezy up north, in fact is is horribly hot! It is nearing the end of the rainy season, all of the crops are fully grown and ready for harvest. I have never been to Tamale in September before and it was quite a surprise to see Maize (corn) and other crops growing right in the middle of the village! Here are some updates on the two pilot villages! 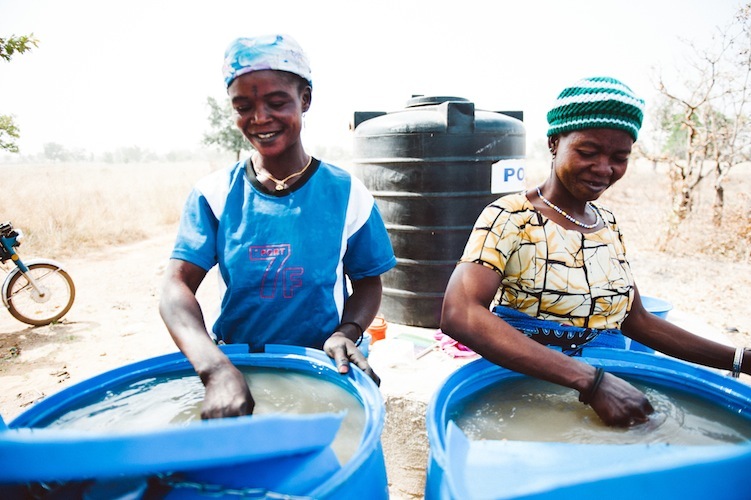 Since the CWS team left Tamale last January, Hawa and Sanatu (the women running the water treatment center in Nyamaliga) have been opening it for business every Thursday morning. The women are happy with the number of people that are coming to the center and enjoy working there. A couple of months ago, the ladies finished their first batch Aquatabs (one of the products used to treat the water) and had to buy more. While this may not seem like a big deal, it was a very exciting event for the CWS team! This means the women were treating the water correctly (they ran out of Aquatabs at the right time) and that they had saved the right amount of money (they had enough funds put aside to buy more Aquatabs)! Unfortunately, a couple of weeks ago the path to the water treatment center flooded and people from Nyamaliga have not been able to get there to buy water. The chief thinks that the path should dry out in the next week or so, so hopefully we can get things up and running soon! Although the flood disappointing, I am glad that I am here to see how the village has reacted. It is very important that our CWS team learns how the water supply in this region changes throughout the year so we can be more prepared for situations like this as we expand to other villages. In other news, Hawa recently had a baby boy! His name is Alhassan and he is precious! Pics to come soon! When our team was in Ghana last January, Kasaligu had just recently began receiving piped water a few days a week. The water flowed sporadically and members of the village never knew when the pipe would work or for how long. (At that time, Ghana was in the middle of an election, and the village leaders were convinced that once the election was over, the pipe would stop flowing). Fati (the women who works at the center) and the village leaders decided to keep the water treatment center open once a week to make sure that the community had access to safe drinking water when the pipe was not flowing. Now that Kasaligu has consistent access to municipal water, CWS’s involvement in the village is going to change. I have discussed the situation with the village chairman and with Fati, and we have decided to move the treatment center to a village that is outside the reach of the BiWater project (and therefore will not have access to piped water any time in the foreseeable future). CWS will still work with Kasaligu by helping promote safe water storage. In the future, Fati may also help me teach the women in the new village how to treat water from the dugout (since she is a pro by now AND can speak Dagboni!) Ill make sure to keep everyone posted on these changes over the next couple of months! This entry was posted in Kasaligu, Monitoring, Nyamaliga and tagged aquatabs, Ghana, social entrepreneurship, Tamale, water, water treatment. Bookmark the permalink. ← Some Pictures From My First Week in Ghana! Thinking of you each day. You have accomplished so much already (in just one very short week). We’re so glad to be able to keep up through your blog and plan to share it with others who are interested in your work. Yay Kate! Sounds like things are going well. Thanks for the news.